Saturday night saw yet another girls night out added to my diary. Well actually it saw two events added to my diary but my inability to remember any dates meant that I’d double booked, again. I’m getting worse at checking what I’m doing and instead find myself agreeing to anything and everything lately. I saw this as a prime opportunity to get the leather hotpants back out…. My work wife (as she will now be known) took me to Topshop on Friday for a little pay-day spree, which saw me buy this leopard print shirt. I love that it’s cropped at the front and then slightly longer at the back. 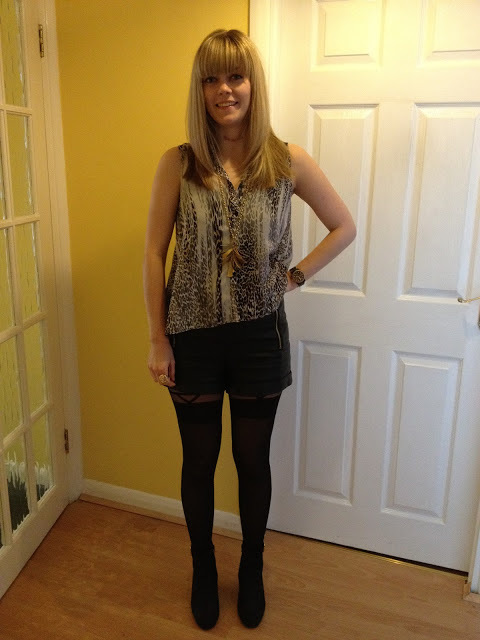 Teamed with suspender tights, black boots and black vest top. I was done and done. The picture below was taken after one too many…. I remember asking some men to move over so I could pose with the statue…. Who’d have thought. There are so many hilarious moments from this evening that I’d love to share, but if I did, I’d have to kill you. Or, my friends me. Aha, I love that last photo!